It’s a Winter Wonderland in the Windy City! The Sears Tower decked out for Christmas! Tip #1: Go to Market! Since 1997, residents and visitors have enjoyed this outdoor German market organized by the German American Chamber of Commerce of the Midwest. Christkindlmarket is held annually at Daley Plaza and celebrates the traditions of Nuremberg, Germany. You’ll see the spirit of Christkind reflected in the many wares and food you will find there. Stop by the Käthe Wohlfahrt tent to purchase glass ornaments, nutcrackers, and other holiday treasures. Or, pick up a traditional German cuckoo clock from Fehrenbach Black Forest Clocks. While you shop, drink some Glühwein in a Christkindlmarket ceramic boot and eat German delicacies, such as bratwurst, warm pretzels, and strudel. It’s a cultural experience you can’t miss! Clearly, this is the market where you’ll find one of a kind gifts! From food to fashion, there’s something for everyone at the One of a Kind Show. Buy colorful hats and mittens to keep your kiddies warm from 32 Degrees or buy a lamp made out of industrial materials for your man from ReTech. In addition, there’s plenty to see and do while you’re shopping at Merchandise Mart. Click here for the schedule of fashion shows, artist talks, and musical performances. Dose is another market that showcases unique gifts by local artists, like moccasins from Girl in Camp and terrariums by Turtlehill. And, you don’t want to miss out on the food! Click here to see what’s cooking during the HoliDose! (Tip: Don’t fret if you happen to miss the HoliDose on December 9. Dose Market occurs on the 2nd Sunday of every month!). Go to Merchandise Mart for the One of a Kind Show, December 6-9! Get a dose of the holiday season at Dose Market’s HoliDose, December 9. These boots are made for drinking…Chriskindlmarket ceramic mugs! Tip #2: Baby, it’s cold outside…but enjoy it while you can! While it’s nice to drink a warm cup of hot cocoa and cozy up next to the fireplace, it’s also a good idea to breathe in the crisp, cool air outside. The Lincoln Park Zoo is the perfect destination for families. It’s FREE (minus parking) and extremely entertaining. In addition to the light displays, there’s live ice carving, 3-D displays, and of course animals! (Tip: The first 1,000 guests each night will receive cool holiday specs to check out the lights!). The most popular outdoor ice skating rink in the city is McCormick Tribune Ice Rink at Millennium Park located downtown. But if you prefer a little more space to do your spins and jumps, try the Rink at Wrigley in Wrigleyville. (Tip: Go to Rink at Wrigley Monday – Thursday. Admission and skate rental are cheaper on weekdays!). If you’re closer to the Southside, check out the Ice Rink at Midway Plaisance Park. It is next to the gorgeous campus of University of Chicago. Admission is FREE and skate rental is $6. This is a taste of ZooLights 2011. Visit the Lincoln Park Zoo website to see what’s in store this year! Tip #3: Sit down and enjoy the show! Chicago is known for theater and improv…don’t miss out this month! Tchaikovsky’s The Nutcracker is a timeless two-act ballet typically held during the Winter season. When Nutcracker is performed by the Joffrey Ballet, it’s simply breathtaking. Watch this 25-year Christmas tradition come to life with bold costumes, jaw-dropping scenery, and beautiful dancing. (Tip: If you’re a college student, take advantage of Student Rush tickets for only $15! Click here for details.). If you’re feeling “bah humbug” about Christmas, try something a little less traditional, like Happy Holly-Daze. This performance by Corn Productions mixes drinks, comedy, and Christmas nostalgia. Also, if you’re into BYOB spots, this is the performance for you! Elizabeth Peabody Elementary School was awarded a $1,000 grant by Macy’s to perform Yes, Virginia the Musical, a play about a little girl’s belief in Santa Claus. Only 100 schools across the country received the grant; and Peabody is the only school in Chicago that was bestowed the honor. This is a proud moment for yours truly (a.k.a. Tip C), because Peabody Elementary is the school my sister, Pam Nicandro-Osorio, teaches at. Please support her students by attending the musical at Wells Community Academy High School, 936 N. Ashland Avenue, Chicago, IL, on Saturday, December 8 at 1:00 p.m. Tickets are $2 per person or a donation (e.g., unused toys, canned goods, toiletries, etc.) made to the Ronald McDonald House near Lurie Children’s Hospital. 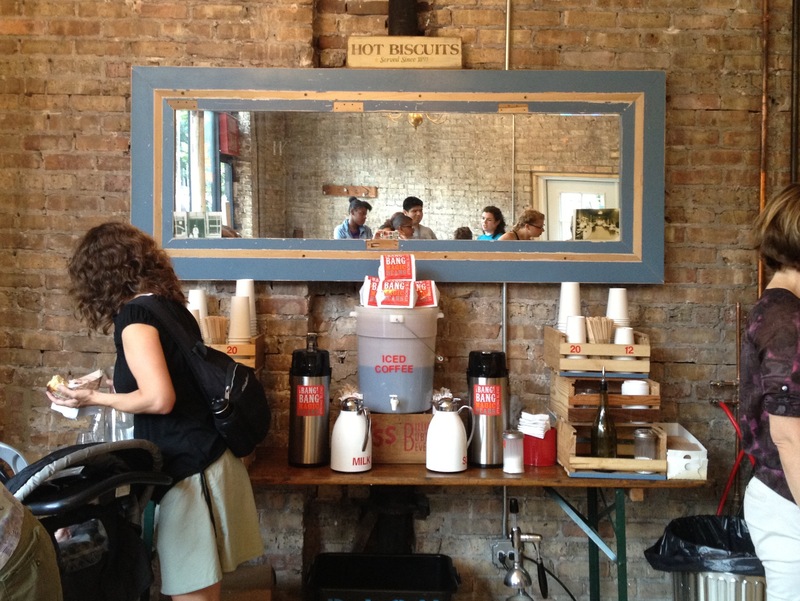 Go for the pies and stay for the biscuits at Bang Bang Pie Shop, located at 2051 N. California Ave. Welcome to Bang Bang Pie Shop! Husband-wife team Dave and Megan Miller created a business that reflects recipes passed down from Megan’s family, which are sweet and homey. As you enter Bang Bang you’ll notice the staff rolling dough in the open kitchen, parents pushing baby strollers into the shop, and couples having conversations over a slice of pie. Everything inside Bang Bang Pie Shop is made from scratch – from the biscuits and pies that come piping hot from the oven to the fresh roasted coffee brewed daily. (Tip: If you’re a coffee addict like me, buy a 12-ounce bag of Bang Bang Magic Beans!). Though Bang Bang may not have a large menu, it’s the details that make the dining experience so special. 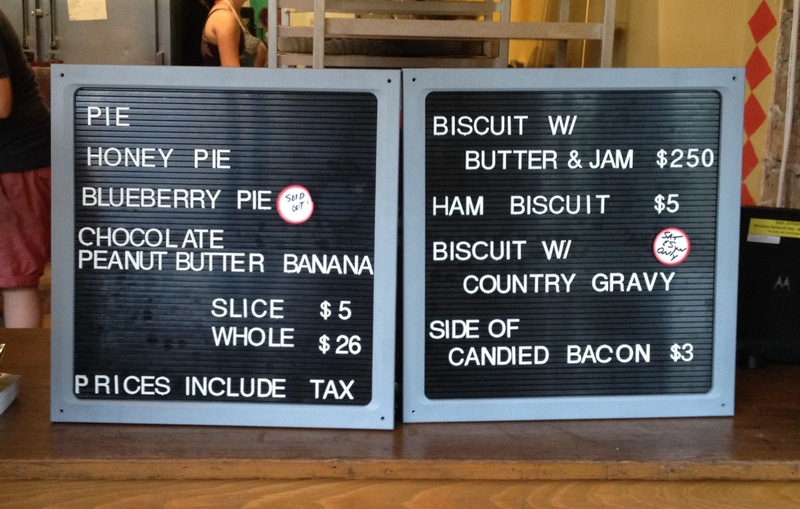 Bang Bang Pie Shop Menu…short, yet affordable! Stop by the coffee station for Bang Bang Magic Beans! Order a biscuit and head to the topping bar. 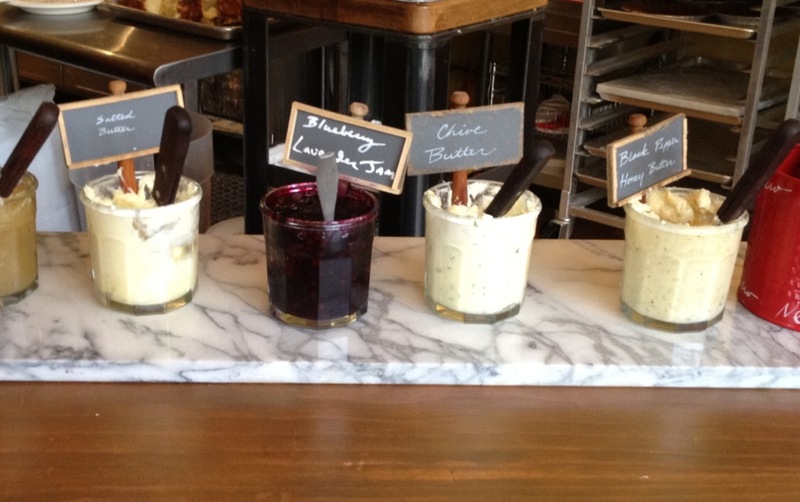 You’ll find a variety of homemade butters and jams to accent your biscuit. 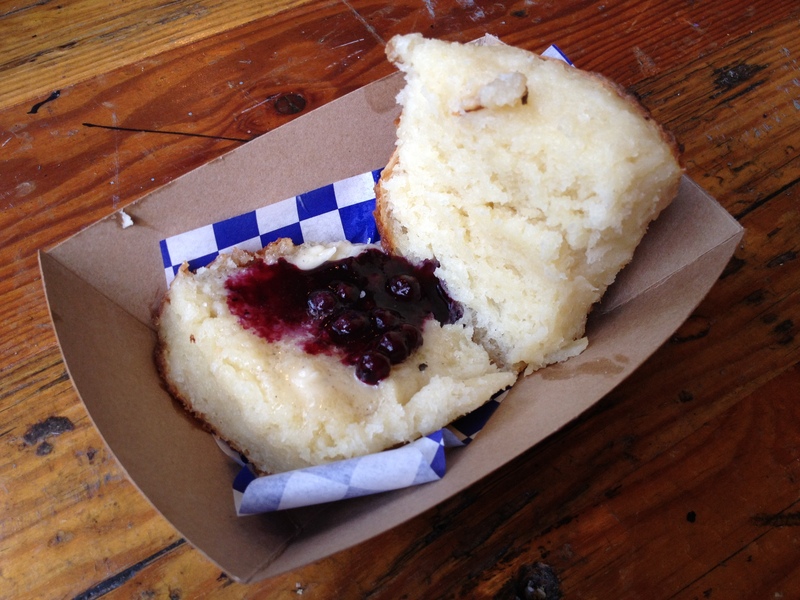 (Tip: Try the biscuit with black pepper honey butter and blueberry lavender jam. Or, add chive butter to the ham biscuit. Trust me, these combos work!). 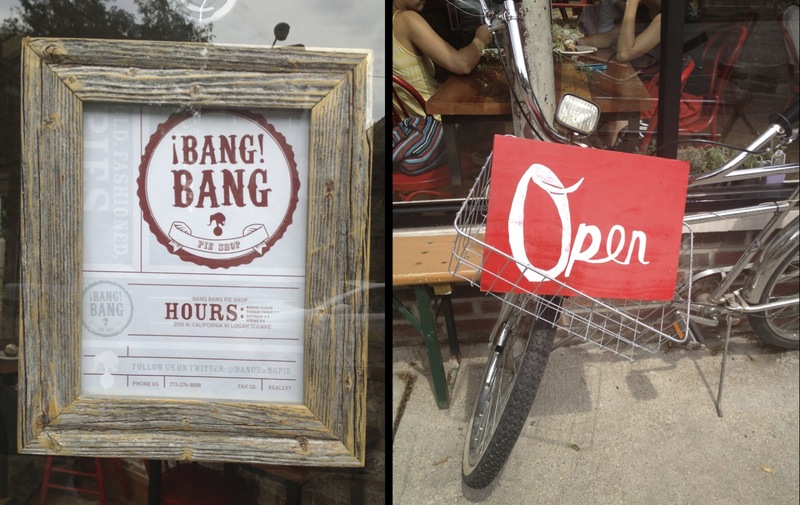 Bang Bang also serves biscuits and gravy, but only on weekends. 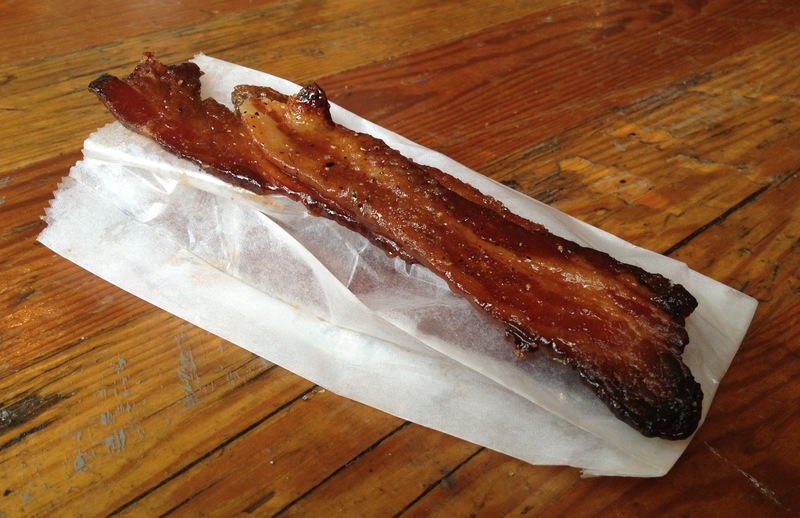 Sweet & Savory: Get a side of candied bacon to go with your biscuit! Of course Bang Bang’s specialty is the pie! And there are different pies to satisfy all sugar cravings – cream pies, custard pies, fruit pies, and chocolate pies. 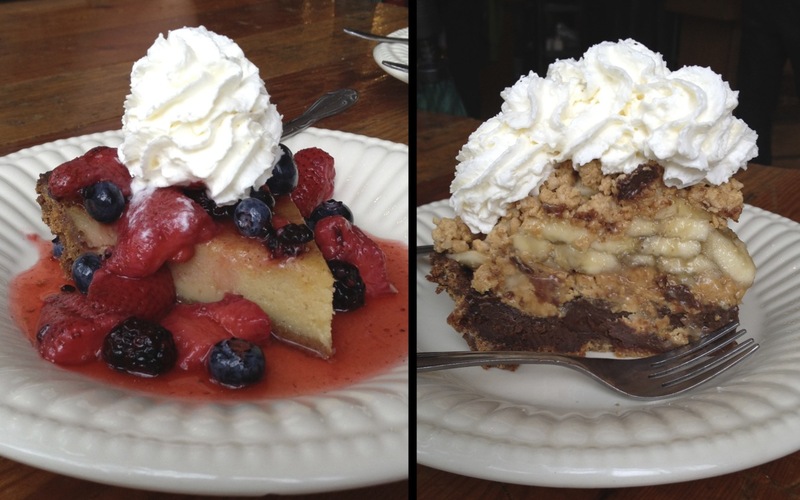 During a recent trip, my party tried the honey pie and chocolate peanut butter banana pie and they were TO-DIE-FOR…just look at the photos below! We wanted to sample the blueberry pie as well, but it sold out. (Tip: Arrive at the shop early or pre-order a whole pie to ensure you get your favorite flavor!). Aside from the nosh, Bang Bang serves up a theater experience. Check out Speakeasy, a Prohibition themed murder-mystery where you could be the prime suspect. It’s BYOB and all players receive a slice of pie. 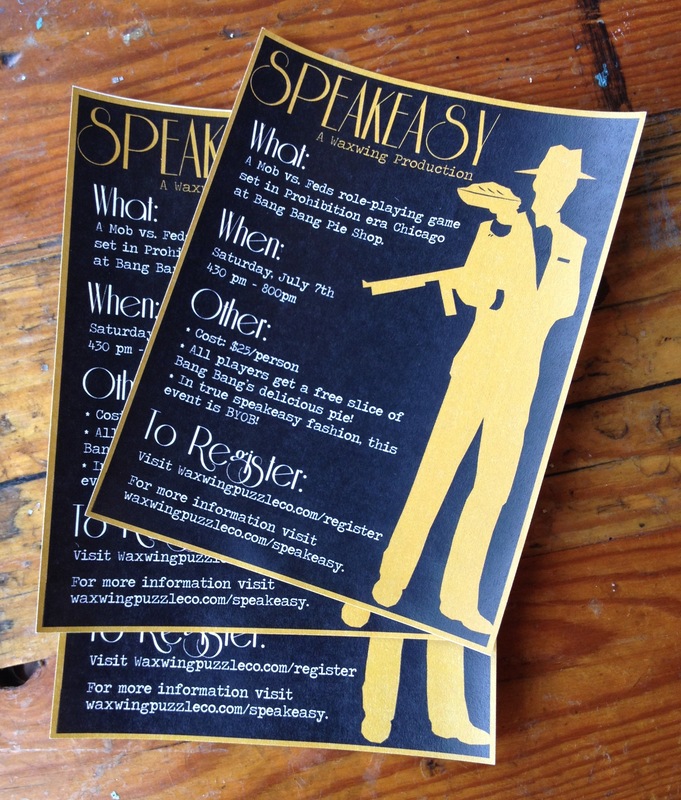 Click here, to reserve your spot for Speakeasy at Bang Bang Pie Shop on Saturday, July 7, 2012. Bang Bang is open Tuesday through Friday 7:00 a.m. – 7:00 p.m., Saturday 9:00 a.m. – 5:00 p.m., and Sunday 9:00 a.m. – 4:00 p.m. Dig into Bang Bang Pie Shop today (except on Mondays when it’s closed)! You don’t have to travel far to reach 90 Miles Cuban Café (2540 W. Armitage Ave.). Enjoy a traditional Cuban meal with a side of white rice, black beans, and plantains. (Tip: Look out for the daily specials, especially the picadillo. It’s a must-try dish!). The restaurant is also BYOB! If you bring rum or wine, the staff will mix you mojitos or sangria!!! Be a locavore and drink a beer at Revolution Brewing (2323 N. Milwaukee Ave.), one of Chicago’s craft breweries. Pair the Anti-Hero IPA with a hand-tossed pizza. (Tip: Ladies, it’s a great place to impress a guy on a first or second date!). I'm Patricia Nicandro and I'd like to take you on a tour of my city! 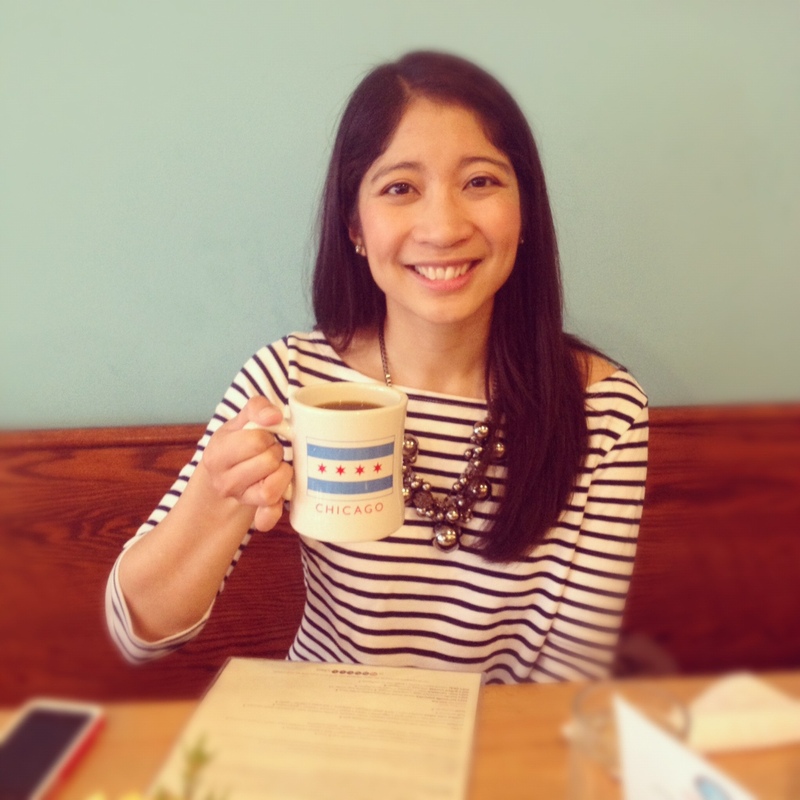 Please use this blog as a guide to travel through Chicago.